Aleksei Mikhailovich Chaly (Russian: Алексей Михайлович Чалый; born 13 June 1961) is a businessman and formerly de facto mayor of Sevastopol. He declared himself mayor in February 2014, amidst the Crimean crisis, after the resignation of Volodymyr Yatsuba, the Viktor Yanukovych-appointed mayor. With Chaly as mayor, Sevastopol participated in the March 2014 referendum in which Crimea voted to separate itself politically from Ukraine and accede to Russia. On 1 April 2014 he was appointed as Governor of Sevastopol City by Russia. On 14 April, he was replaced by Sergey Menyaylo. Chaly was born on 13 June 1961 in Moscow. Parents: inventor and scientist Michail Chaly, mother Alevtina Chalaya, Candidate of Engineering, university professor. Grandson to Soviet vice-admiral Vasily Chaly, hero of the Great Patriotic War, Commander-In-Chief of the Black Sea Squadron (1956–1961). Chaly graduated from the Sevastopol technical institute. Since 1987 he has been the head of "Tavrida Electric", producing switchgear and anti-wreck technology. At the moment of political crisis in Ukraine in 2014 he had Russian citizenship. He was involved with restoration of the memorials of the World War II, producing the documentary series "Sevastopol Tales". In 2011 he received the international award "For faith and fidelity" as a symbol of recognition of his contribution to the Motherland. On 23 February 2014, a meeting of citizens opposed to the Euromaidan movement that ousted the Ukrainian government from power in Kiev led to Chaly being proclaimed as "mayor" of Sevastopol. The Sevastopol City Council handed power to Chaly on 24 February, following the resignation of Volodymyr Yatsuba as the city administrator appointed by the President of Ukraine (at the time the city had no elected mayor). On 26 February, Chaly declared that Sevastopol would not submit to orders of the acting leader of the Ukrainian home office, Arsen Avakov. Simultaneously, he invited officers of the officially disbanded Berkut riot police unit to the city. He said that they can become a basis for future defence groups in the city. Chaly visited the Kremlin in Moscow on 18 March 2014 to sign the Treaty on Accession of the Republic of Crimea to Russia together with Russian President Vladimir Putin and Crimean Prime Minister Sergey Aksyonov. The Security Service of Ukraine has announced an investigation into Chaly for allegedly steering some 23.9 million hryvnia from his charitable organisation to bankroll anti-Ukraine activity. On 1 April 2014 he was appointed as acting Governor of Sevastopol City by Russia and occupied this position till 14 April 2014, when he resigned and was replaced by Sergey Menyaylo. ^ Юлия Гутова (2014). Серьезный разговор с Алексеем Чалым и другими людьми, которые сохранили русский Севастополь (in Russian). Русский репортёр. ^ a b "Ukraine: Sevastopol installs pro-Russian mayor as separatism fears grow". The Guardian. 25 February 2014. Retrieved 29 March 2014. ^ Владимир Путин подписал указ о назначении временно исполняющих обязанности главы Республики Крым и Севастополя (in Russian). Echo of Moscow. 15 April 2014. Retrieved 15 April 2014. Serhiy Anatolyovich Hayduk is a Ukrainian Vice Admiral and a former commander of the Ukrainian Navy. The Governor of the City of Sevastopol is head of the executive branch of the political system in the city of Sevastopol. 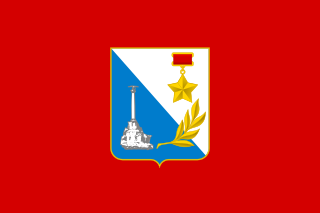 The governor's office administers all city services, public property, police and fire protection, most public agencies, and enforces all city and state laws within Sevastopol. 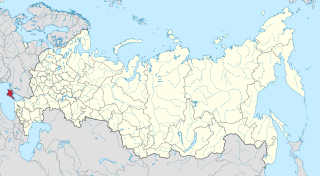 Ministry of Interior in the Republic of Crimea is de facto the main police authority in Crimea in the Southern Federal District that was established by Russia after the 2014 Russian annexation of Crimea. Crimea is recognized as part of Ukraine by most of the international community. The Prosecutor's office of the Autonomous Republic of Crimea - is a State Government Body. According to the Constitution and the Ukrainian Law its functions at the Autonomous Republic of Crimea are: prosecution, representation, supervision and control. According to the Acting Prosecutor General's decree No33 dated June 12, 2014 the Prosecutor's office of the Autonomous Republic of Crimea was temporary relocated to Kiev. Sergey Ivanovich Menyaylo is a Russian political military commander, former deputy commander of the Black Sea Fleet and between April 2014 and July 2016. He served as the Governor of Sevastopol between 2014 and 2016, but decided to leave the post to be appointed to be a Presidential Envoy of the Siberian Federal District.